Taste test: These chips had more of a pepper taste rather than a "salt and pepper" taste, as the pepper overpowered any other flavors. 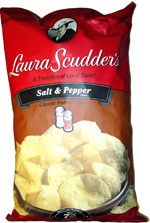 We generally like the Laura Scudder chips for their thin cut and crunchiness, and the chips didn't disappoint here. The only thing that did disappoint us was the overabundance of pepper instead of the balance of the salt and pepper. Smell test: A really disgusting odor, with a slight pepper smell. 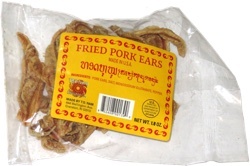 This snack was discovered by Keith and Melissa at Albertson's. Review published .